They might not have mastered GPS technology, but vervet monkeys can solve multi-destination routes in the same way humans do. 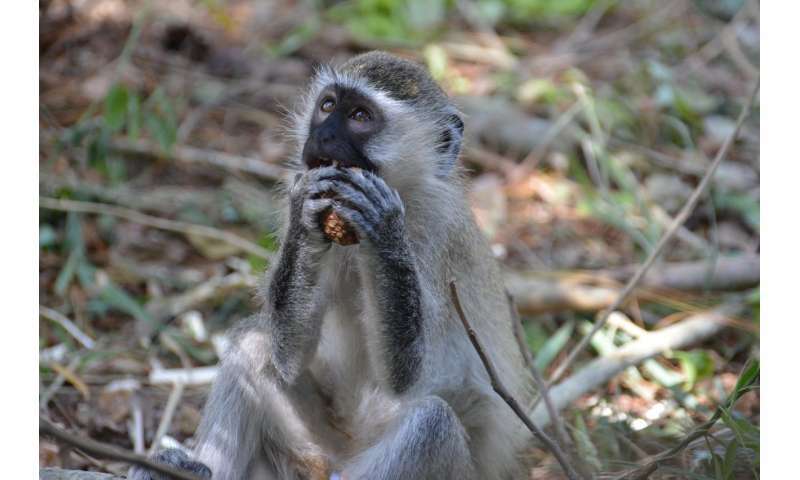 A new U of T Scarborough study published in the journal PLOS ONE has found that when foraging for food, vervet monkeys apply simple rules-of-thumb (also known as heuristics) to find relatively short routes without having to think too much about it. "People are amazed that animals can often find the shortest route when foraging for food, and the big question is how they're able to figure it out," says lead author Julie Teichroeb, an assistant professor in the Department of Anthropology at U of T Scarborough. "Solving these kinds of routes is extremely difficult mathematically but we've found that these monkeys, much like us, rely on heuristics." Heuristics are basically mental shortcuts meant to ease the cognitive burden of making complex decisions. While these decisions may not be perfect or even the most ideal, they get the job done. After all, getting paralyzed trying to choose from the infinite number of ways to get to several destinations has many costs, especially when trying to locate food. Monkeys in particular seem to be good at figuring out the shortest route right away without needing much time or practice, says Teichroeb. 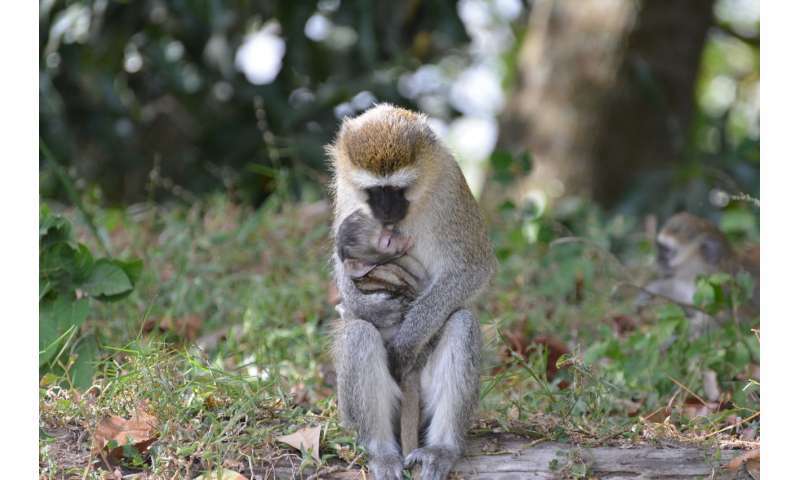 In the case of vervets, they often end up using a method that humans use called the "nearest neighbour rule," which is essentially choosing the closest site that hasn't been visited yet. Teichroeb and her co-author Eve Smeltzer, a Ph.D. student in U of T's Department of Anthropology, observed the vervets at Lake Nabugabo in Uganda, near Lake Victoria. Using a simple array of platforms containing food, they observed that the monkeys would typically go to the next nearest location. But when the researchers created a condition where using simple heuristics would no longer lead to near optimal paths, vervets showed an ability to plan their route. A couple of monkeys were even able to routinely figure out the shortest possible path after the condition was introduced, showing individual differences in skill. "This is only the second animal where planning of foraging routes has been found, the other being noisy miner birds," says Teichroeb, who is an expert on primate behaviour, specifically evolution of group living and social organization. 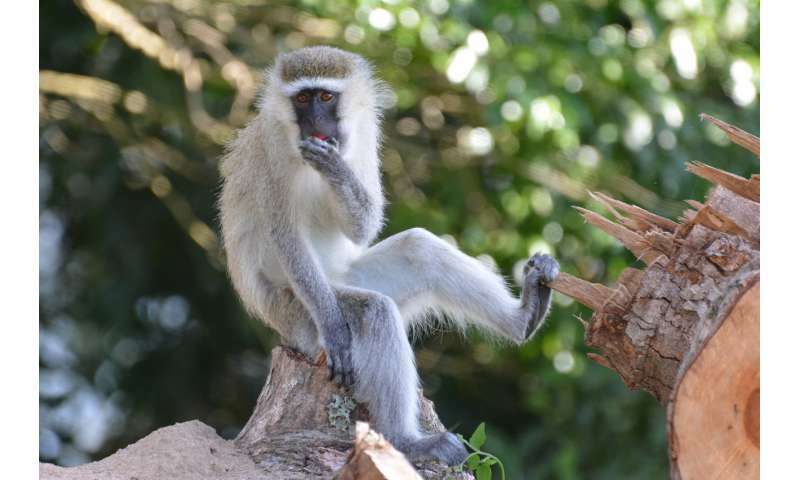 Vervet monkeys are found mostly throughout Southern Africa and help serve as a nonhuman primate model for understanding genetic and social behaviours in humans. They've been observed to experience hypertension, anxiety, social dependency and even display spiteful behaviour. While it's likely other primates can also plan foraging routes, many are hard to observe in the wild since most prefer to live in trees, notes Teichroeb. Vervets on the other hand are perfectly happy on the ground and are relatively comfortable being near humans. In the future, Teichroeb hopes to vary other characteristics of the food available in her experiments, such as its nutritional quality or ease of access, to see if there's a change in the routes the vervets take. These variables may also affect behaviour depending on social status with subordinate vervets choosing the closest food site, while those that are more dominant may try to find and defend better food sites. Teichroeb has observed that the strategy vervets use when they are alone appears to be different from the strategy they use when they're with others. "That's really fascinating and hard to show in natural populations of primates because they're so social and it's rare for individuals to leave their group and complete an experiment on their own," she says. "I really want to get at what's most important in the resources that they choose, and how that changes their foraging routes and decision-making."